Will Democrats pick a Sam Johnson to vie to replace U.S. Rep. Sam Johnson? 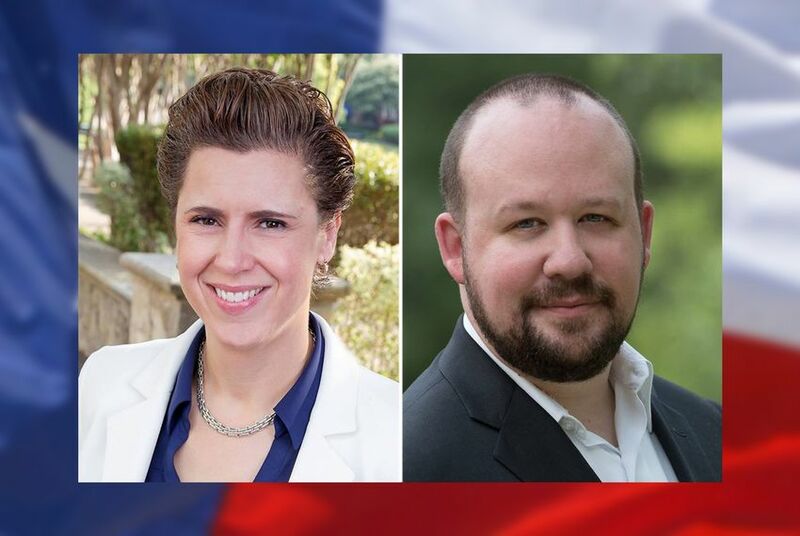 The Democratic runoff between Lorie Burch and her runoff opponent, Sam Johnson, has turned heads, but not because Democrats have high hopes that they can represent Texas' 3rd Congressional District. PLANO – Since 1991, U.S. Rep. Sam Johnson has represented a section of Texas north of Dallas. The 87-year-old Vietnam War veteran last year announced his plans to retire. In Tuesday's primary runoffs, one of the names on the Democratic ballot will be Sam Johnson — but it's not the same Sam Johnson. The 35-year-old lawyer has no relation to the Republican congressman. The quirk of Johnson's candidacy has drawn attention to the Democratic race in Texas' 3rd Congressional District, even though state Sen. Van Taylor, the Republican nominee, is widely viewed as having the general election locked up. At first, the younger Johnson found himself defending his campaign to local media. "I would be running if my name was any other name," he told NBC DFW shortly after announcing his candidacy in July. Johnson doesn't deny that his name has helped him standout in the race, arousing some suspicion from local Democrats. He also doesn't blame voters for thinking his candidacy could be a gimmick. But after his first candidate forum in January, voters began to take him seriously, he said. "I think the fact that I'm in the runoff shows that I'm qualified and that voters understood that and that it wasn't just about the name," Johnson, who earned a little less than 29 percent of votes in the primary, said in an interview. His runoff opponent, Lorie Burch, a 41-year-old attorney, nearly avoided a runoff entirely. She got 49.6 percent of the vote against Johnson and two other candidates in the March 6 primary. She said she doesn't begrudge her runoff rival, whom she called a legitimate candidate with "a good heart and a good mind to try and create change." But Johnson's name recognition, she says, won't be enough to beat her in the runoff. "What effect do I think that has had? Maybe a few percentage points, possibly, but not enough to make a difference for him," Burch said. That so many Democrats even vied for the seat has turned some heads. The odds are certainly against any of them turning the seat blue. Voters in the district, mostly composed of growing cities like Plano, Frisco and McKinney, have not elected a Democrat to the U.S. House since 1967 and haven't gone for a Democratic presidential candidate since Lyndon B. Johnson in 1964. The demographics of the area, nestled in rapidly expanding Collin County, are shifting. The county's population has grown by about 24 percent in seven years, the equivalent of over 187,000 people, according to U.S. Census Bureau estimates. Nineteen percent of the county's population is foreign-born, and the area's booming South and East Asian communities have given Democrats hope that the district could be put into play in the coming decades. But the county's changing landscape doesn't cancel out the number of voters turning out for Republicans. Taylor earned more votes in the March 6 primary than the four Democratic candidates combined. That's not to mention Taylor's massive financial advantage, having raised over $800,000 and loaning his campaign another $1 million. Burch, by comparison, has raised about $147,000. Taylor, who carried 84 percent of the vote in his primary, has earned a spot on Capitol Hill newspaper Roll Call's list of "almost, probably, most likely members" of Congress. Yet both Burch and Johnson maintained they would fight for the seat in November and that they weren't counting on a possible "blue wave" to help them in a place like Collin County. Burch said she would emphasize to voters her plan to listen to constituents. "They want people who are transparent and accountable, who will listen and understand that not every issue is black and white," Burch said. "I find that a lot more people resonate with that then they do with this idea of, 'We just need to vote for Democrats.'"